Now, I have also decided to be kind to those on slower connections, so we will have fewer visuals and more text. In no particular order, here it comes. All I can say after using this product for the last three months is "how did I ever edit without it?" Earlier versions of the SuttlePRO were reported to have experienced software incompatibilities resulting in some strange behaviors in FCP. The combination of the ShuttlePRO v2 hardware and software revision version 2.02 results in a perfectly functioning, glitch free and workflow enhancing device. 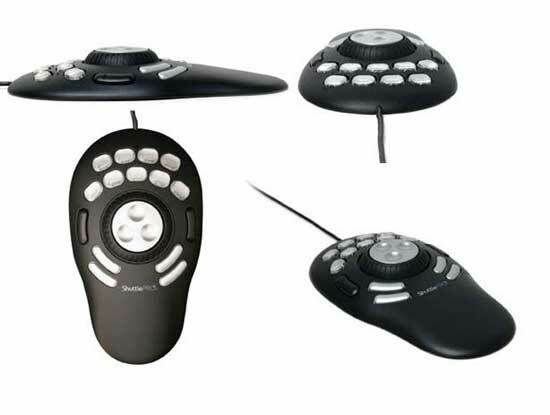 The Shuttle Pro sits flat on your desktop (uncluttered, hopefully) and contains a jog wheel, shuttle wheel, two rows of 9 buttons across the top, a button on either side of the wheel, and two rows of two larger buttons on the bottom. 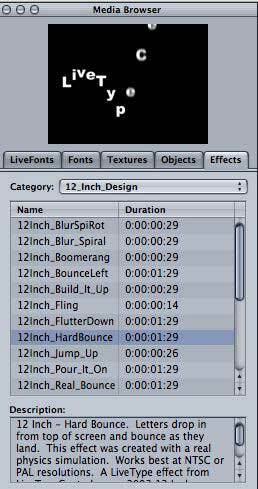 But, before you think that you are spending $129 on a device only for Final Cut Pro, just look at all of the application presets which are provided, and look carefully. You can even create your own customized settings, all accessed via the Shuttle Pro application, a shortcut to which resides in the upper right of your computer screen. But, as tempted as I might be to speak about the other uses of the product (and I use it with my web browser regularly), let's just talk about FCP. Note that once within the FCP menu, the pull-down on the ShuttlePRO menu brings up three possible configurations of the device. This allows you to switch between the various modes. Take a look at just one choice for button mapping in log and capture. The button to the left of the wheel is mapped to Log In. You will see the keystroke combination as well. Note that you can remap the buttons to suit your tastes. But how does it work, you ask? Once you either memorize and button assignments or create your own custom button assignments and remember them, everything just seems to go smoother in your editing. On a personal note, I confess that my least favorite part of the process is log and capture. I am a "i" ­ F2 kind of guy. I mark my in-point and then like F2 to log the clip. The ability to accomplish this with my hand on the ergonomic ShuttlePro and fingers ready to press buttons just "feels right." Yes, it is a subjective evaluation. But everyone's work habits are subjective. While we may all work differently, each of us demands products that work. We (or at least most of us) would rather edit than troubleshoot the program. With the improvements evident in the ShuttlePro v2, I have found no need for troubleshooting. It simply works, quickly, accurately and responsively. 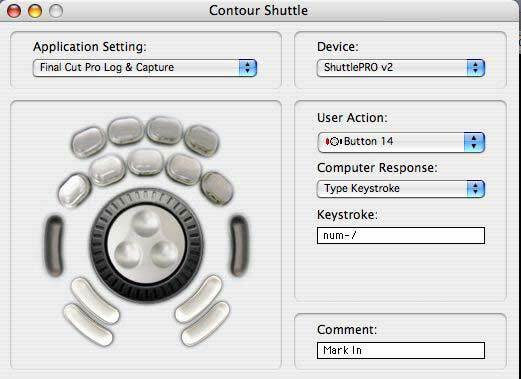 If you want to streamline your workflow, free yourself of many keystroke combination dependencies and feel that your hand is really constantly on the control, rush to your nearest dealer or on-line site for a ShuttlePro v2. This is a product about which I offer no caveats, no reservations - just praise. I own a Sony PD150. The smaller DV/DVCAM units have a number of advantages, but sometimes size actually works against you. Veterans accustomed to toting Betacams on their shoulders know that the weight of the camera actually creates sufficient inertia to stabilize the shot. It is much harder to keep the smaller camera stable when hand-held and even tiring to do so. I have tried everything imaginable in the lower end range of DV camera mounting and stabilization systems. Stationary hand-held stabilizers can be difficult to balance, but, once balanced I dare anyone to try to hold that device for more than a few minutes. 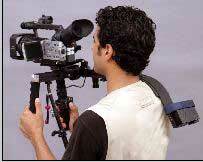 Your forearm actually functions as the articulated arm of a steadicam-type device with vest and arm. And its gets tiring. Then there are the hand-held gimbel devices. Again, they are very heavy and require balancing. Not having been the most coordinated cub scout in the pack, I simply could never get the knack of a gimbel-based device. So, when I had the opportunity to see in action and then purchase a DV Rig Pro, I jumped at the chance. No, you don't get to see actual photos of me. You see, the DV Rig Pro consists of several components: a shoulder mount with a counterweight on the back (which could also hold a brick-type battery), adjustments for up/down, a Bogen (Manfrotto) quick release plate which is also adjustable side to side both for balance and viewfinder or LCD screen, and a belt with a spring-loaded rod which attaches to the bottom of the camera plate and sits in a little pouch in the belt. DV Tec also provides a belt extension to those whose girth exceeds the standard size belt. It is for those reasons of girth that I prefer to make television, restrict most of my on-air work to radio, and not serve as a model for the DV Rig Pro. Like any device that also includes stabilization, the DV Rig Pro does require some tweaking of the back counterweight and side to side motion of the camera. Having achieved that, it is possible to use those two front handles just with finger tips. I usually attach my Varizoom to the right handle and compensate for the weight with balance. 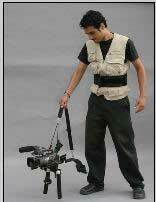 Combining the belt, spring-loaded rod and shoulder mount keeps the camera stable and distributes the weight evenly. The rig itself with counterweight is somewhat heavy, but this weight adds to the stabilization. I have been able to shoot with this unit for long stretches. In fact, my feet usually give out before my back and arms. 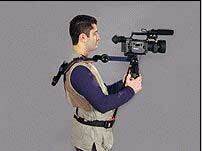 There is also a shoulder strap which can be used as a low-mount, and the unit itself rests nicely on a table or on the ground for a stationary or ground-level shot. Other accessories include a radio mike holder, shorter rod, carrying case and on-camera light. For those attending NAB 2004, designer Danny Natovich will be showing the rig personally in the Cartoni booth. This is another Ned-recommended product. Again, subjectively, it works for me. The downsides are cost and an occasional feeling of being restricted in the spontaneity of your shots. Changing shots might require loosening and tightening the knobs or the spring-loaded rod. It might be harder to use the device following fast-moving and variable action than it would be to shoot hand-held. There is a learning curve to effectively "flying it." But for wedding, event, ENG and controlled production uses, this product is a winner. Let's leave hardware and accessories now and head to the add-ons department. Here I want to highlight add-ons for Soundtrack and LiveType. Let's start with Soundtrack. In one my many incarnations within this life, I was a pioneer in the early days of Desktop Publishing (I hated the word, but I also hated the $5000 I spent for my first laser printer in 1982). You can never have enough clip art, I used to say. Well, now I say you can never have enough loops. True, within Soundtrack we can use any Acid loop. But there is a distinct advantage in buying loops which developers have customized for Soundtrack. That is a simple timesaving advantage. Since the loops are already categorized for ST, there is no need to open each one in the ST Loop Utility and create search keywords. Of course, you always have that option should you wish additional customization, but who has the time. We can also save some bandwidth here because you can go to the web sites yourselves to see the DVD covers and the only other visual representation of audio files I could imagine is to post screen shots of wave forms. I have been working with some Apple Loops from www.samples4.com. The developer is a fine British lad who prices all of his products in the Queen's currency. But at prices that range between £30-£60, these collections are really bargains. I personally have evaluated and included in my collection the 16db Drum and Bass Interface as well as the 2-Step Ahead package. The drum package is well-constructed and consists of breaks, bass licks, synths, synth pads and just generally a combination of both wild and "normal" sounds. I love the 2-Step ahead for modern-style loop creation. There are 13 groove kits which are almost self-contained tracks as well as several hundred beats, one shots, sound fx, synths-you name it, this package has it. The site also sells Acid-compatible loops as well as loops specifically tagged for Garage Band. Don't overlook it in your quest for additional loops. Finally, I want to highlight some add-ons for LiveType. Back when Prismo Graphics introduced India Pro, a whole collection of LiveFonts began to appear on the market. Once Apple acquired India Pro and the application resurfaced within FCP 4 as LiveType, I knew it was only a matter of time until additional LiveFonts, backgrounds, objects and textures would be offered by independent developers. Now, for these, we need some visuals. I need to highlight the most recent addition to LiveFonts first because this collection was crafted by one of the original developers of India Pro. Included in the package are 10 handwritten fonts. Here are example of 5 of the Handwritten series. This is a nice and inexpensive package, and even less expensive if you act before the NAB 2004 offer ends. 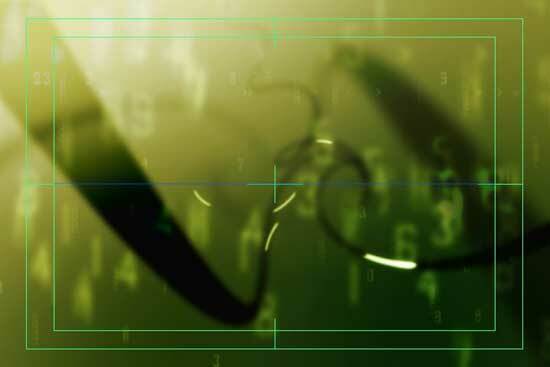 I think they work most effectively in creating a write-on effect, which you accomplish by selecting the Timing tab, setting Sequence to 100% and speed at a large number (or by dragging to the desired time duration) and then if desired setting a Hold Last to the number of frames you wish to hold the effect). 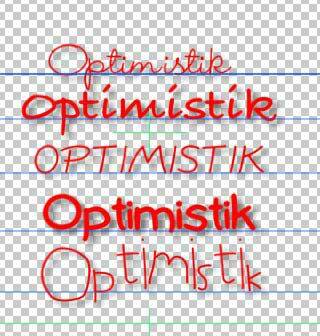 Like any handwritten font, the lines are delicate so you would need to choose colors and backgrounds with care. The LiveType Central products are developed by Arizona-based 12 Inch Design, which also produces an excellent line of motion backgrounds. Here you can find just about anything you want and in any price range. The LiveFonts are available in a Gold and Platinum line, with Gold suitable for DV and SD and Platinum fonts possessing resolution to go all the way to HD or Film. The Gold fonts should be used at smaller sizes on screen. As an example in pricing differential, a collection of Gold fonts sells for $199 with its corresponding Platinum LiveFont collection priced at $399. But, don't think for a moment that the Gold Fonts will appear degraded or pixilated or are in any way inferior work. They are not. As an aside, the process of creating a LiveFont is both tedious and exacting and developers are entitled to compensation for their time and talent. 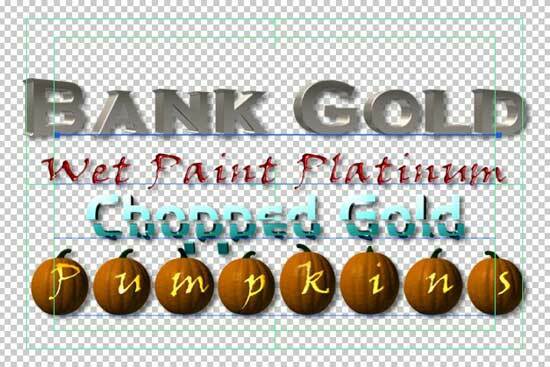 Here we see some examples of Gold fonts with one Platinum font. Pumpkin is my favorite. I guess it only has limited use, but it is still clever. Here is a really cool texture. You would certainly expect that from a company which began in the texture business. Now, note some of the Effects which I have in my particular collection. I have highlighted the Hard Bounce effect as one my favorites. Finally, I'll just highlight one of the many Templates available. This particular template includes motion, moving background, text place holder and can be used very effectively in a contemporary-style presentation. Let me note something else about the templates. For our PAL users, LiveType seems to have neglected PAL templates. 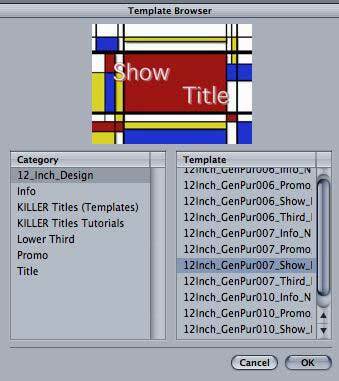 LiveType Central offers their templates in both NTSC and PAL standards. By virtue of sheer volume of LiveFonts, Textures, Objects, Effects and Templates available, LiveType central offers the most extensive collection of LiveType add-ons currently on the market. If you can't find something you like in these hundreds of items, well, you're just too picky. Now, having seen a smattering of other collections, you may wonder why you should pay $65 for just a single font. There is one simple reason-these are the best crafted of all the LiveFonts I have tested. In the two fonts which I have acquired, the continual variation of color and the ability to enlarge the fonts to virtually any size without artifacting shows that they are crafted with care, not to mention with creativity. The web site describes them as works of art and indeed they are. I would not hesitate to use these fonts in HD or film and I would certainly use them in projects where artistic titling is of the essence. Do not overlook these fonts, few in number but high in quality. You will not be disappointed and with no denegration of the other products intended, these fonts win the Ned-award of this review. I am impressed. 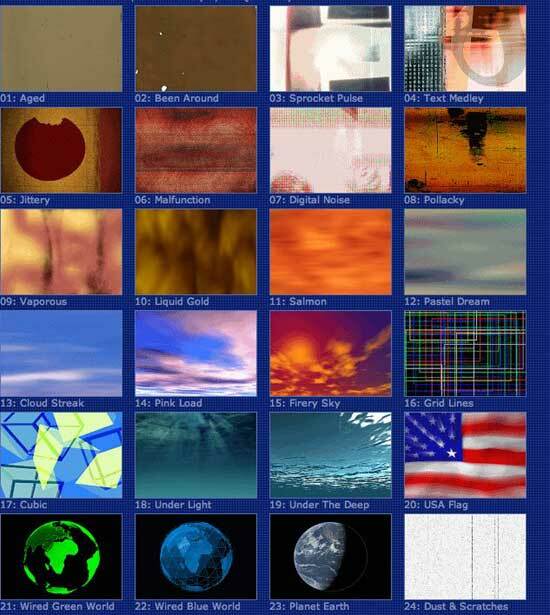 I just had to show you all 24 animated textures and objects in this collection. These graphics were created in cooperation with the master teacher of FCP, Steve Martin and constitute his first entry into add-on development for LiveType. What is so impressive here is that the 3D elements were modeled in Maya and brought into the textures and objects. Currently the package is only available in NTSC but a PAL version is promised shortly. My verdict-well crafted, creative, useful. There is nothing dull about any of these items and I do believe that $99 for 24 textures and objects does constitute excellent value for the money. There you have it. My desktop should now be clean but somehow it remains cluttered with assorted papers, notes, unpaid bills, and fragments of my next book. Stay with me after NAB 2004 for reviews of new products which will no doubt come my way as well as for a longer article I am writing, tentatively called "A FCP and AE User Migrates to Combustion 3." For those attending NAB 2004, watch for me on the show floor or in my usual role of selling tickets for the FCP User Group bash. At least until the latest diet is successful, I won't be hard to spot.